Green Ghost Game of Mystery, TRANSOGRAM No. 3905 was released in 1965. My Green Ghost site will take some of the mystery out of the variations of the GREEN GHOST GAME. There are many different versions and variations of Green Ghost so it becomes confusing what exactly the GREEN GHOST game should look like and contain to be original and complete. 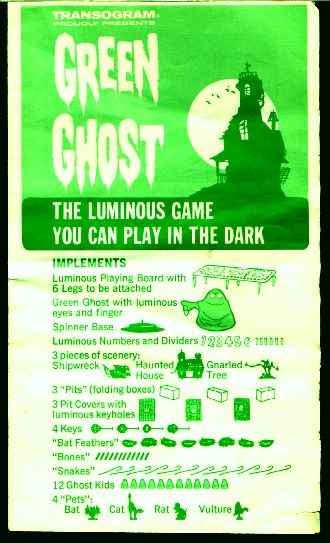 But before we talk about the variations of Green Ghost we should talk about what each Green Ghost Game had in common so we can understand the differences. the game board, the green ghost eyes and finger, numbers and dividers on the spinner and the tops of the tomb pit covers. 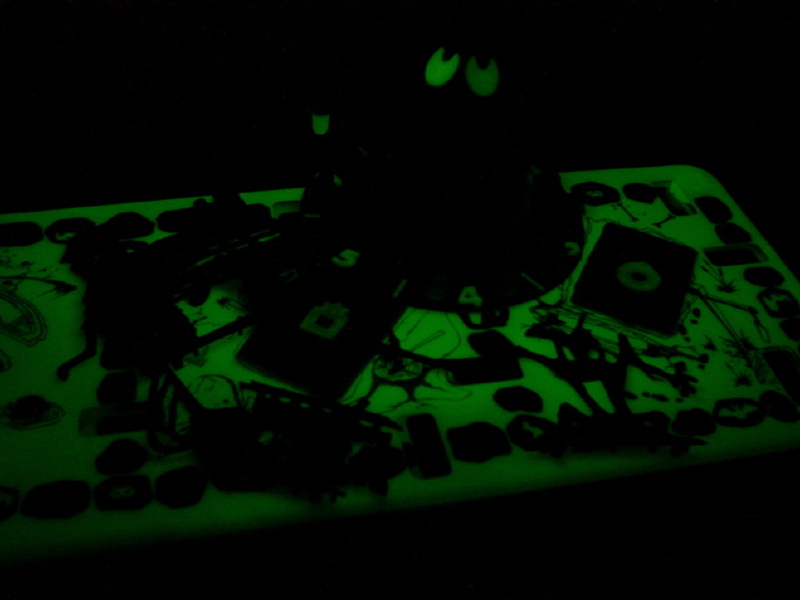 Some unusual Green Ghost game parts that often got lost are thrown away are: bat feathers (a handfull of black feathers), Bones (12 small black pellets) and Snakes (12 rubber bands). I am guilty as well as almost throwing away these parts. They are so unique as game pieces you assume they aren't part of it. WELCOME TO MY GREEN GHOST GAME SITE!!! Have I mentioned this site is all about the Green Ghost? Bat Feathers (real feathers) Achoooo! Pets: Bat, Cat, Rat, Vulture. The Parts, The Variations, Care Repair, Marx version, Locate Games. Green Ghost Parts Everything you need for a complete set. Green Ghost Variations I have come across many different versions/variations of the original 1965 set.I have dedicated a seperate page to cover some of the variations. Care Repair Page to share some tricks I have discovered in caring for your game to restore it to its natural luster! You may even discover some hidden surpirses in your set from following my tips! MARX Green Ghost Game Re-issue Differences between the Marx Gren Ghost and the Transogram Green Ghost compared. GREEN GHOST GAME Links to help you locate these games and more info about them. NEW!!! TALK TO GREEN GHOST ON MYSPACE!!! GO TO THE SIDE BAR TO SEE THESE PAGES.